Phew! I though I would still be working on this at Christmas but Chinese Coins is done. I usually choose the binding when the quilt is finished. This fabric, though, was in the initial pull and I have kept it floating about in my eye-line rather than tucking it back into a box because I have always been sure I wanted to use it. There have been (numerous) times while I was working on this that I wondered what I was doing. This little quilt seemed dull and the freehand cross-hatching seemed like a good idea gone bad and was taking longer than even I could enjoy. I wondered if I should have ruled all the quilting lines, worried that the variations in the grid would look sloppy, at one point nearly put the whole thing back in the cupboard (something I never do: I start, so I finish). But guess what. Quilted, bound, completed - I just love this quilt. I love the gentle colours and the shirt fabrics, I love the shapes and the quilting - just love it all. Mostly I see things I would change at this point, but for whatever reason this one seems just fine exactly as it is. Just goes to show you can't second-guess these things. Started 3rd February 2017 as part of the first AHIQ challenge, set by Ann. Finished piecing 31st March 2017. Started quilting 17th June 2018. Finished size 69" x 71". Made from a big pile of shirts and fabrics from stash. Bound with a stripe bought in the Oakshott warehouse sale about 8 years ago. Wadding is Sew Simple Supersoft Eco Blend (70/30, all recycled). Quilted, using ordinary quilting thread, with a mostly free-hand crosshatch pattern. Linking up today with Kathy for Slow Sunday Stitching. Wow! Your quilt looks amazing! The colours and shirt fabrics give it a cozy, comfortable feeling. I love the liberated piecing. Congrats on a beautiful finish! Beautiful and cozy looking. I'll bet it sleeps good. I love it too, and I'm having the same what was I thinking thoughts about my current shirts project.I carry on though, I'm sure when bound :) it will knock off my socks. I love the softness, too, and the pinwheels with the white add a lot of sparkle. Love your comment I start so I finish! I too am a determined quilter. I also love quirkiness as I call it in quilts but it is hard to do when you are taught to try and be perfect. So glad you could push thru that feeling and complete this quilt. It is wonderful and I love how it all came together. I just love it all, too! Congratulations on a wonderful, beautiful finish! Good to see the plaids and stripes in your quilt. Good use of shirt prints. I absolutely LOVE the finished quilt -- LOVE!!! Congrats on the finish - and I know you'll enjoy using it. I just love it all too. Your persistence paid off. Congrats to you on something so inviting I just want to grab and snuggle in it. And who knew it was the color of hydrangeas. Those are hydrangeas, right? Well, whatever they are I love the photo. Each time you post a finished quilt I think, "This isy favorite." Once again, I feel that way. Love the soft colors, the way you merged Chinese Coins and Medallions, the crosshatch quilting,and the stripped bnding. Wonderful use of old shirts. Thanks for joining that prompt wholeheartedly. Love it-love it-love it. It's funny how we can change our minds about a quilt. Maybe it's because we spend so much time with the same colors and fuss about the decision making. All of a sudden we want to finish it any way possible just to get it out of the way. Then, it suddenly becomes appealing again - like we're seeing it for the first time. I don't know about you but I'm pretty fickle - ha! Your quilt turned out really nice. I like the grid design a lot. Oh! I'm so glad I didn't miss this post. I love how this quilt turned out so very much. It's been fun seeing your progress with this and the changes and metamorphases it has gone through. What a wonderful friend now that it's finished!!!!! A lovely quilt. 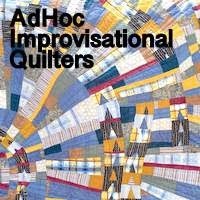 I love the soft colours, the improv piecing, the stripey binding, and all your handquilting. And most of all, I love how you use 'old' shirts and create something so ... just right! A super duper finish!!! Love it, quilting pattern perfect and it looks amazing with the hydrangeas.The back is also a work of art . It is oh so lovely. Congratulations! It is fabulous! That binding brings all the colors together. You did a wonderful job. I love it! The quilt! I never liked olive, the vegetable or the color, but I can occasionally eat one or two now. I'm wondering if I could quilt with it. I absolutely love it in your quilt. Mixed with the other soft colors, the solids and, especially, the shirt fabrics, it's not quite so sour as I generally think of it. You've included just the right amount (percent? ratio?) to keep it from becoming overpowering but it's still an important color in the whole of the quilt. You handled Ann's challenge with finesse! Everything about the quilt says comfortable, cozy and quiet, "come on and curl up." Including the quilting lines, so you can quit fretting over them. I love everything about this quilt. It's just so right. I'm so glad you carried on with the freehand quilting. You have inspired me greatly with this one. Thanks!! The binding is perfect. Congratulations on the finish; do you have plans for the quilt? This is truly a beautiful quilt. I love you have used old shirts and the varying patterns are fabulous. Your hand quilting is wonderful and the binding finishes this beauty perfectly. I do believe there is nothing quite like a hand quilted quilt. A truly splendid finish. I love how I discover pin wheels as my eyes move around the quilt. The foliage backdrop in your photo draws out the greens in the quilt. So pretty! The quilt looks calming from far, but I also enjoy the nuances in the colors close up. I am so glad to hear that you love the quilt, because it truly is lovely! The last photo of your quilt amongst the hydrangeas is beautiful. The binding makes this beautiful quilt pop! Well, I'm a little behind the times but I really love this quilt. Congrates on a wonderful finish! !